Warrantee on geysers and water heating panels covered by producers. Your installation is important to us and we want you to be proud of your investment. We take pride in our work/services. Most of our work comes from references of satisfied customers (by word of mouth). It is therefore of utmost importance for us to deliver the best service possible. 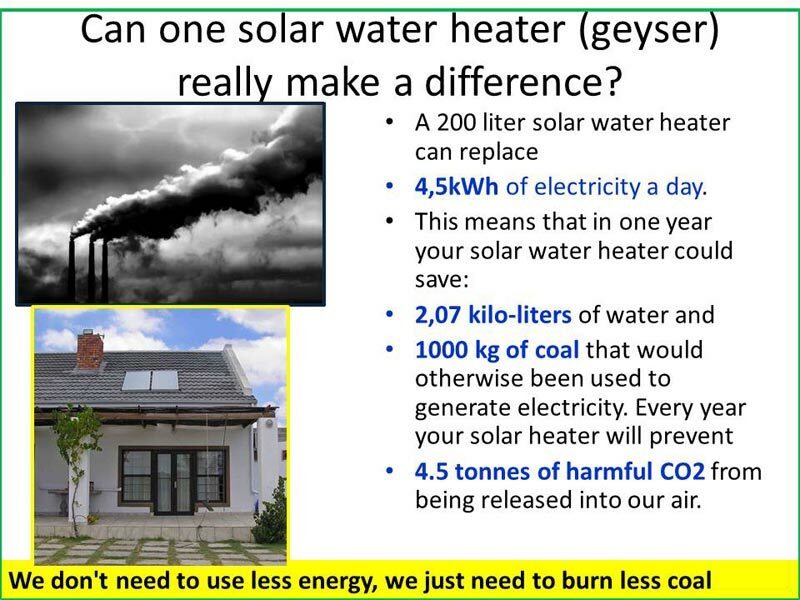 By switching your electrical geyser to solar, you lower both your electricity bill and your carbon footprint! Do you have a burst electrical geyser? Make use of the payment from your insurance into your bank account – this is the ideal time to switch your geyser to solar. Step 1: Contact Solar Juice to visit your house for a free onsite visit and to provide you with a replacement quote which you submit to your insurance – please remember to notify them that you are switching to solar and that they must provide you with the money and not replace your electrical geyser. Step 2: At the same time as step 1, we provide you with a solar geyser system installation quote. Please note: It is your choice which installer you use. Step 3: When you are ready and satisfied with our quote, kindly let us know and we contact you and arrange an installation date. Keep your new geyser and we retrofit the geyser (connect it with solar panels, etc. ).